Vibrant Media, the company best-known for its in-text advertising, is unveiling a revamped product lineup today. The changes should make it a little more clear that Vibrant’s in-text ads are indeed ads, while also giving advertisers the opportunity to deliver something a little more splashy. On the user notification side, there have been some nice, if relatively subtle (hey, there’s not much room to work with) changes to the way that the links to Vibrant’s ads show up in the text. Instead of just underlining and highlighting relevant words in green, there’s a now a small icon next to the link. Then, once you hover over the ad (if you’re on a desktop) or tap on it (if you’re on a tablet), it actually flips over to show the advertiser’s logo and company/product name right before the ad itself appears. In some cases, there’s also a countdown before the ad appears, so you can move the mouse cursor away if, for example, you don’t actually want a video to start playing. From the consumer side, that should cut down on moments where you accidentally hover over a link, then think, “Wait, what just happened?” That’s probably better for advertisers, too, especially since they get to show a little more branding in the process. You can watch a demo of the redesigned links here. 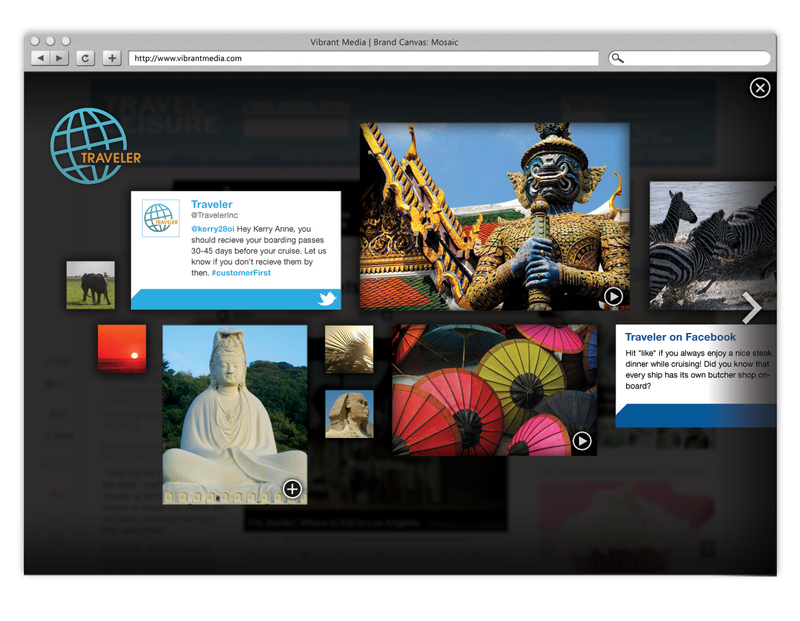 Vibrant is also launching a new Mosaic ad unit, which is a full-screen, interactive experience. Again, Vibrant started out by offering its ads in a relatively small window. But now that it’s giving users more warning about what they’re getting into, it’s also offering advertisers an opportunity to get a little more aggressive. That means there are now three in-text units that advertisers can choose from — the initial 300 x 250 pixel ad unit, the Lightbox video format (announced earlier this year), and the new Mosaic. As for the idea of “in-context” advertising, Irvine means that Vibrant should deliver relevant ads in a number of different contexts, not just in-text. The company already offers display and in-image ads (and it acquired Image Space Media earlier this year to expand those efforts). Lightbox videos already work in the image ads, and the company says Mosaic units will be added soon. Vibrant says it now works with 6,500 publishers and reaches more than 300 million unique users per month.